The piece “Shayona Cement gets kudos for developing Kasungu factory site: Minister hails community-investor good working relationship” featured below was initially published in Malawi’s Mining Review Issue Number 27 2015 that is circulating this July 2015. Minister of Transport and Public Works, Honourable Francis Kasaila MP, has commended Shayona Cement Corporation for its investment at its Kasungu Factory, which has seen members of the surrounding community benefitting through securing employment and reaping from the company’s corporate social responsibility projects. The Minister noted that the huge investment at Shayona Cement Factory is playing a big role in uplifting the fortunes of what could have been a remote area of Kasungu. You, people of this area made a right choice by embracing Shayona. Just continue to be patient because I foresee this area continuing to develop. As Shayona scales up its activities here, many more locals will secure employment. The company will also continue to invest in corporate social responsibility activities. With a workforce of 1200 mostly locals, Shayona Cement Corporation has undertaken a number of corporate social responsibility projects at the factory site including construction of school blocks and provision of education bursaries to students from the area. The Minister took heed of a joint invitation from Shayona and the surrounding communities to visit the factory and appreciate the progress of the investment as well as the challenges that are being encountered in the process. During the meeting it came out that the major challenge the area is facing is the bad state of the 27km earth road which stretches from Mwimila Turn-off to Shayona factory. 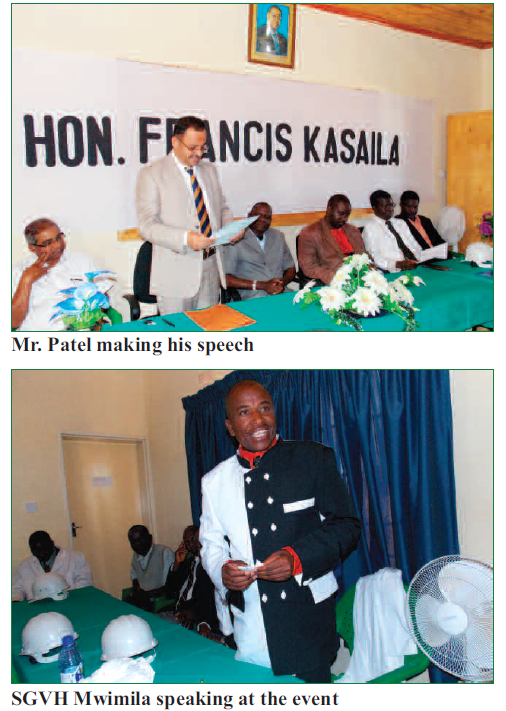 During the meeting held at the factory, a number of speakers including Traditional Authority Wimbe, Senior Group Village Headman Mwimila; Member of Parliament for Kasungu East Constituency Honourable Madalitso Kazombo and the Corporation’s Managing Director Mr. Jitendra Patel expressed concern over the sorry state of the road. for being the first Minister responsible for works to visit his company’s factory and urged the Minister to ensure that the access road to the factory is kept in good condition. In his response, the Minister gave an assurance that as a facilitator of investment, Government would move quickly to rehabilitate the road saying a grader had already been allocated. The Shayona factory was opened in 1997 with less than 100 employees and an average production capacity of 100 tons of cement per day. With ongoing investment by the company, the production capacity has shot to 650 tons per day and the workforce has ballooned to 1,200 employees. Once a remote area, a small town is gradually emerging at the factory site now experiencing a facelift with new infrastructural developments on course. Among other developments, the place boosts of decent staff houses, portable water, electricity, a police unit and a well stocked health centre courtesy of Shayona Cement Corporation. The company, which has constructed school blocks at a nearby primary school, has also acquired land to construct a Secondary School as part of its corporate social responsibility initiatives. The Rotary Cement Manufacturing Plant includes a crusher, a stacker re-claimer, pre-heater column, raw and coal mill among others necessities, that would be centrally controlled in a room fitted with an automated gadget. When all is completed, Mr. Patel said the new plant will be able to produce more than 30,000 bags of cement per day. Shayona Cement is one of the companies that substantially contribute to the Government’s coffers remitting MK2.5billion annually in royalties and taxes. The firm is also contributing to the local economy by sourcing a considerable amount of raw materials locally including limestone mined from its Livwezi Mine, iron ore and clay. The firm imports gypsum from Tanzania and coal from Mozambique but is negotiating with local suppliers of these cement production ingredients to ensure that a bigger proportion of raw materials is sourced locally. Shayona Cement, which produces Akshar Cement, caters for over 25% of the market share for cement in the country and is expected to take up to 80% of the market share when the new rotary kiln plant is commissioned in 2016.